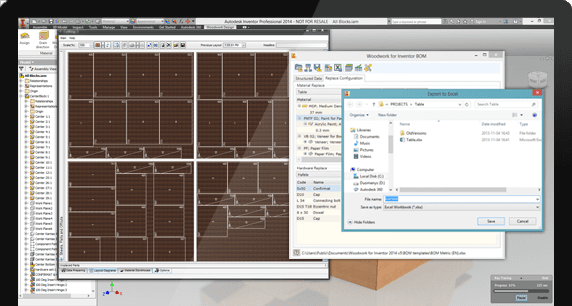 Woodwork for Inventor CAM module has an additional feature which allows creating CNC programs used to cut out parts from a single workpiece sheet. User can open the designed product and automatically create CNC technologies for each individual part. The technologies created will take into account the edge banding and pattern direction of the part. Then, the CNC technologies can be automatically selected and transferred to the cutting scheme design environment. Here, the user will be provided with a preliminary layout of CNC technologies (parts) onto workpiece sheets. All parts are arranged on workpiece sheets suitable for the material of the parts. The user can edit the layout schemes interactively, change the position and direction of parts on the sheet. If necessary, parts can be deleted, copied or moved to another sheet. Cutting characteristics are thereby programmed for all parts of the product. 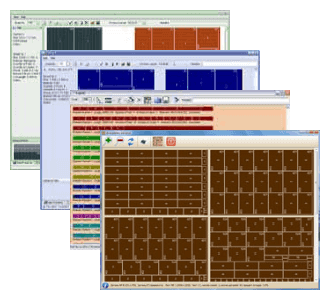 Once the desired layout results are achieved, a single command is used to generate CNC programs for each individual workpiece sheet. The format of the created CNC program depends on the machine, which can be specified for any material in the Woodwork for Inventor add-on. Woodwork for Inventor has a very flexible mechanism for combining specifications. To achieve this, you simply have to change the template in MS Excel format and in this way you can generate a report of a desired form. This principle allows easy generation of reports of a desired form and preparation of reports it so that they are supported by other programs. The software also links with a popular cutting optimisation program CutRite v.8.0 designed to prepare programs for CNC panel cutting machine tools. The software provides the transference of data required for optimal cutting (dimensions of the blanks to be cut) but also data on edge banding, material, position of the CNC base point, etc. This data is then transferred to the label printer (if any) and integrated with the machine tool. This greatly facilitates part identification during the manufacturing process and saves the time of employees within the company. It is easy to prepare reports for any other program that can read the data in MS Excel or CSV formats. Instruction of how to export the parts to the cutting optimisation program.